With ‘Storm Chaser’ – their first single post the release of the ‘Wake Your Mind’ album - still doing well, Nic Chagall and Bossi aka Cosmic Gate are ready to make some heat again with their new track, ‘Crushed’. 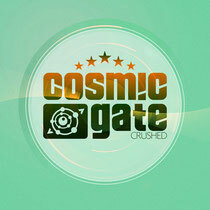 Making its first appearance on their Trance Nation mix-comp album in 2012, ‘Crushed’ became a popular request for crowds at C.G. gigs. Now, it’s all set for release on July 15. Beating the remix path for the track, Comic Gate have handed the track’s keys to underground Dutch producers Rafaël Frost and Mark Sixma. Premiered on Corsten’s Countdown 313, Rafaël Frost crushes in both harmonic shades and electro aspects to the front end of his version. He builds the track with big concussive tech-trance sequences; building the pitch before its big mainline. Armin meanwhile has been all over the Mark Sixma’s mix, champing it on ASOT618 and 619. Sixma charges his rework with percussion, popular EDM FX and some bass and drums. The Tilburg-based producer sets up the track’s harmonic interchange with some modulation lines, pulling off a big top-of-the-drop moment. Check it below.